There is still so much to sow and plant. 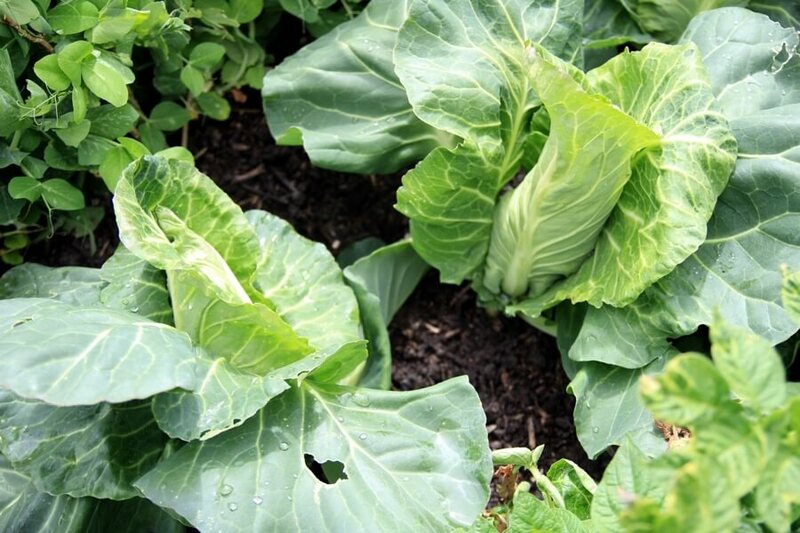 Now is good to sow cabbages for autumn hearting, Brussels sprouts, French and runner beans, sweetcorn, more carrots, lettuce and multisow beetroot, even leeks if you have not already. 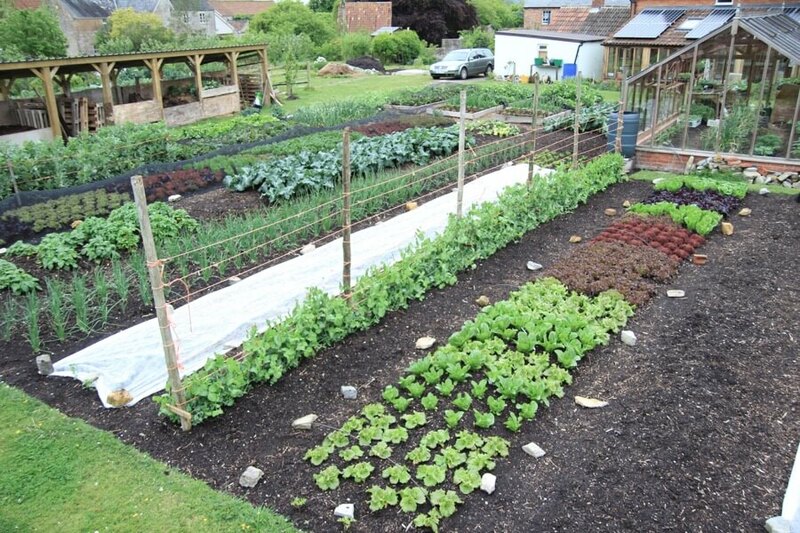 You can set out plants of celeriac, sweetcorn, tomatoes, courgettes, squash etc. 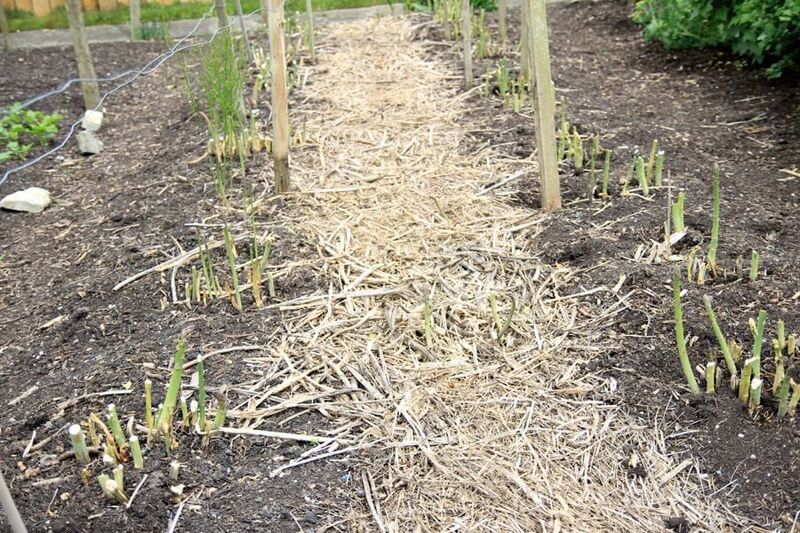 No dig with mulches helps to retain moisture. 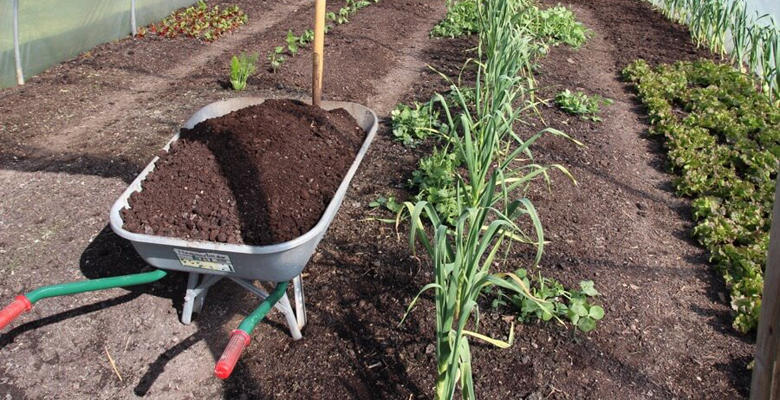 Even a compost mulch, although it dries on top, serves to insulate soil and retain humidity below. Simply dib holes in the compost, deeper than your plants so the stems are buried. Until the end of May, it’s more reliable to sow runner and French beans undercover, because they do not like cool nights. You should be able to sow outside soon. In the greenhouse I lost some bean and cucumber seeds to a mouse, but then caught it in a trap. Rodents love all fleshy seeds and in my case the hotbed offers them a home. 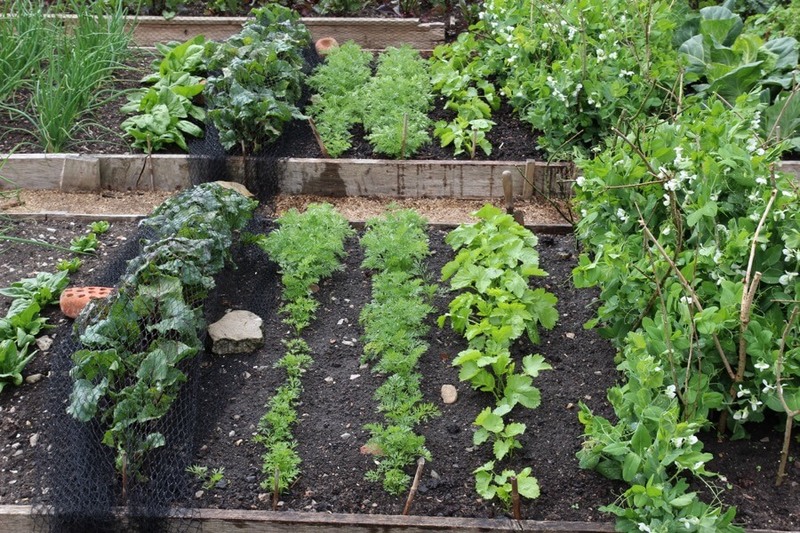 Meanwhile the cool-season veg planted in spring are coming along nicely at Homeacres. For most of us, the tender plants can now go out, but it’s early June for some colder northern areas. 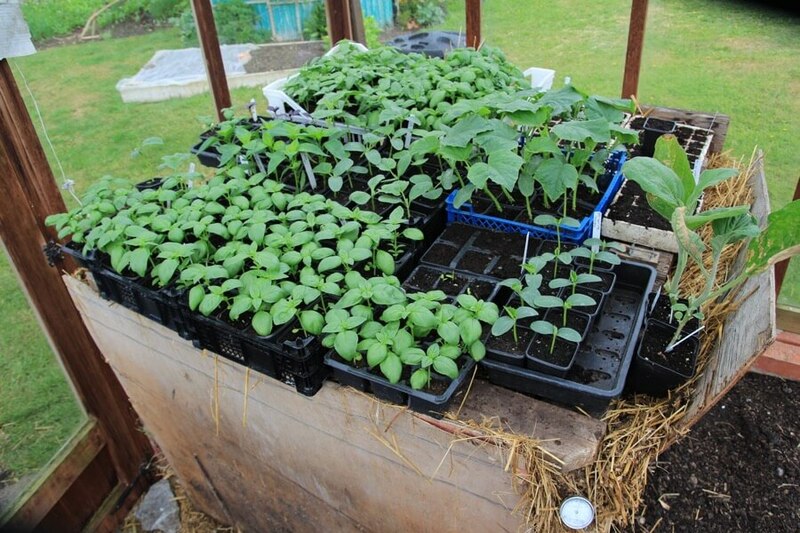 This week we are planting 3-4 week old courgettes, squash and sweetcorn, and French + runner beans at month’s end. In greenhouses and polytunnel it’s good to plant tomatoes, cucumber, aubergines, peppers and chillies, any time during the next month. And basil too. 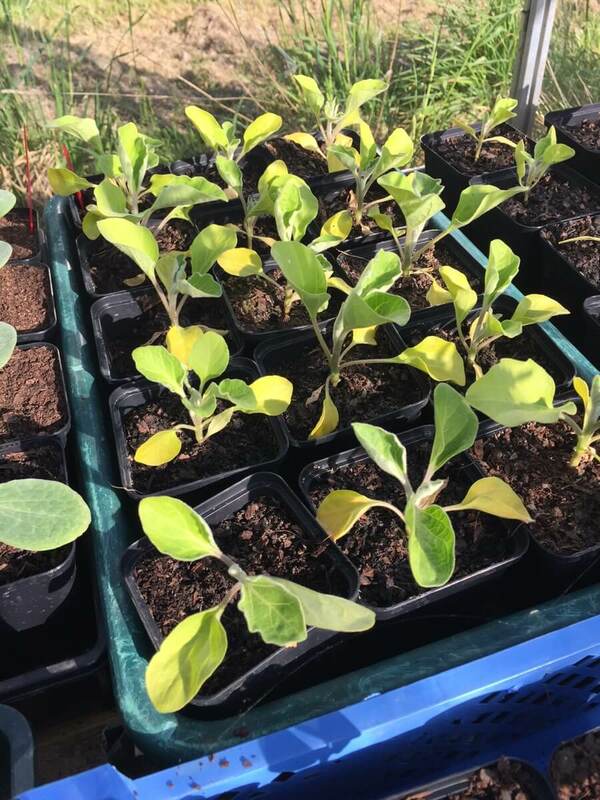 If you have plants looking like the aubergines below, they need repotting or planting out. 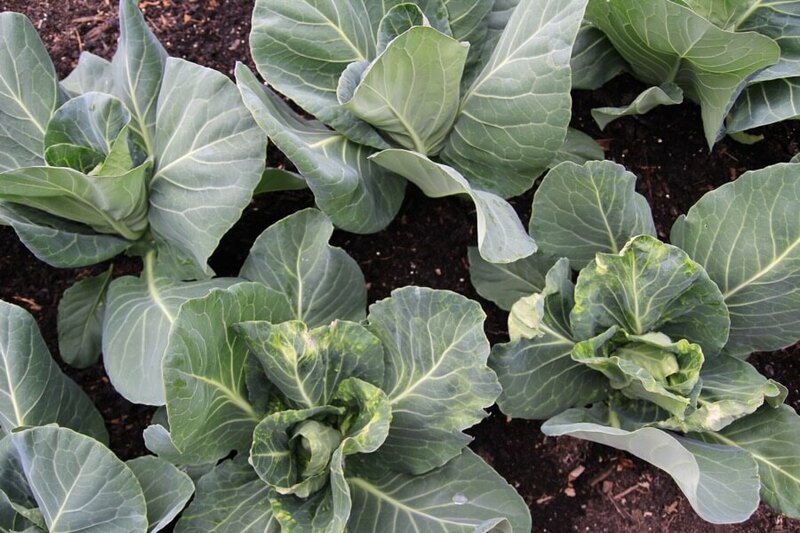 When lower leaves start to yellow, there is no food left in the compost and growth stops! Many composts based on wood fibres are lower in nutrients than ones based on peat. My appearance on television has sparked a healthy interest among people starting out. 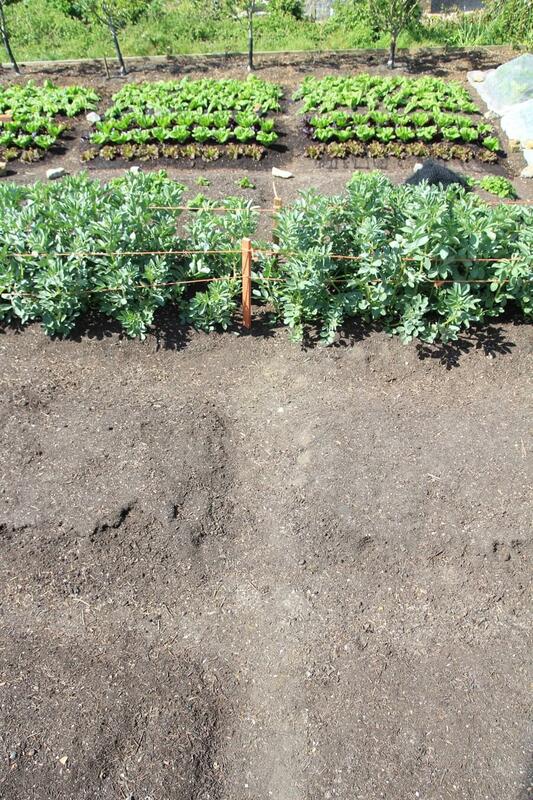 You can make beds at any time of year, such as now, then sow and plant straightaway. 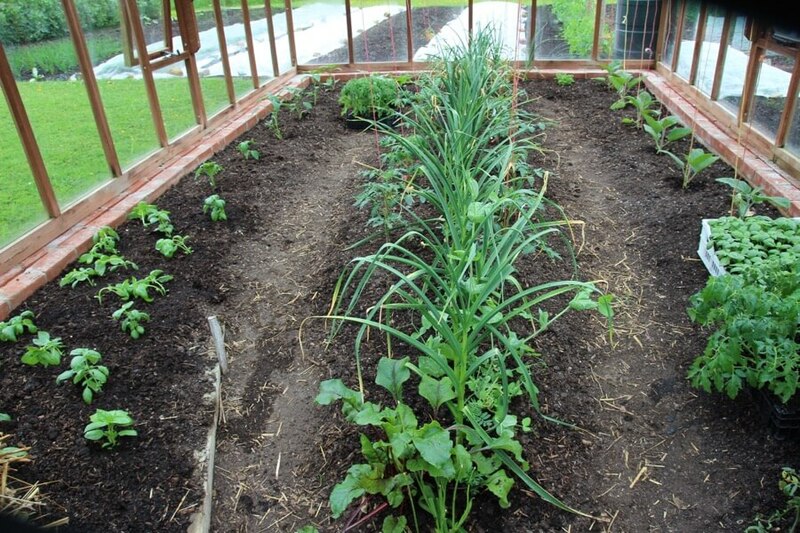 No need to wait for weeds to die underneath. 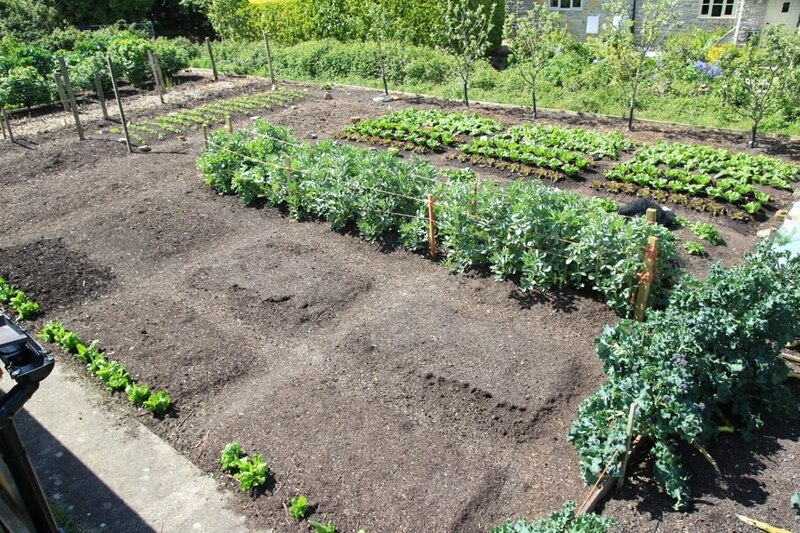 The photos show some of my trial beds which are 4ft/1.2m wide, and without wooden sides. The narrow paths are 15in/40cm. In 2013 we mulched the whole area with polythene to kill the pasture weeds, for 14 weeks in the spring. 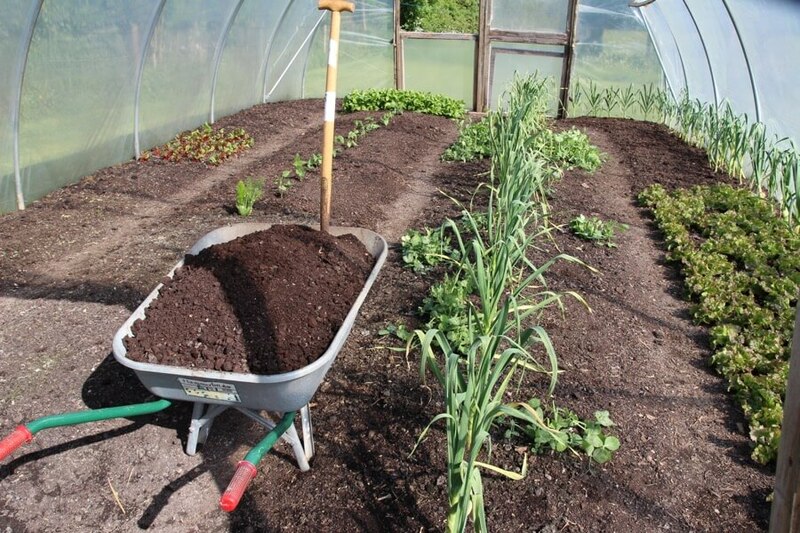 The right hand strip has all its beds forked, the other two are no dig, and the left hand strip has different compost of well-decomposed cow manure. 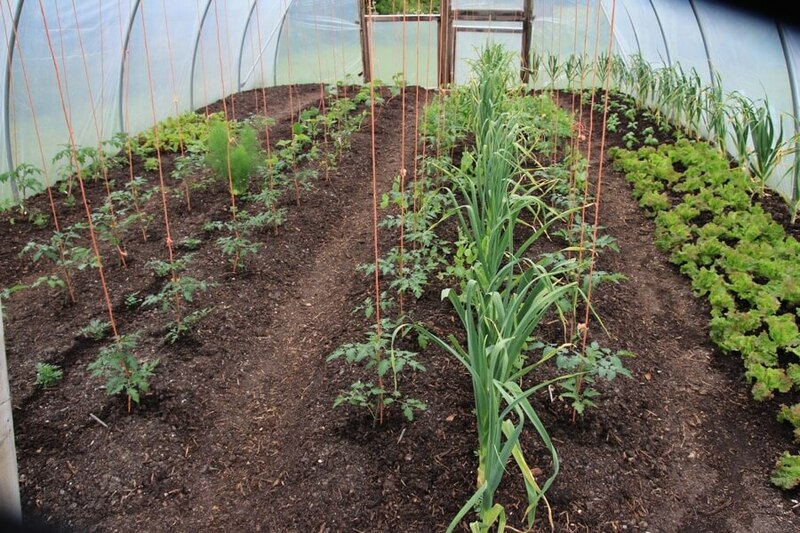 Over four years, the highest yields are from the middle strip, no dig with fine compost. 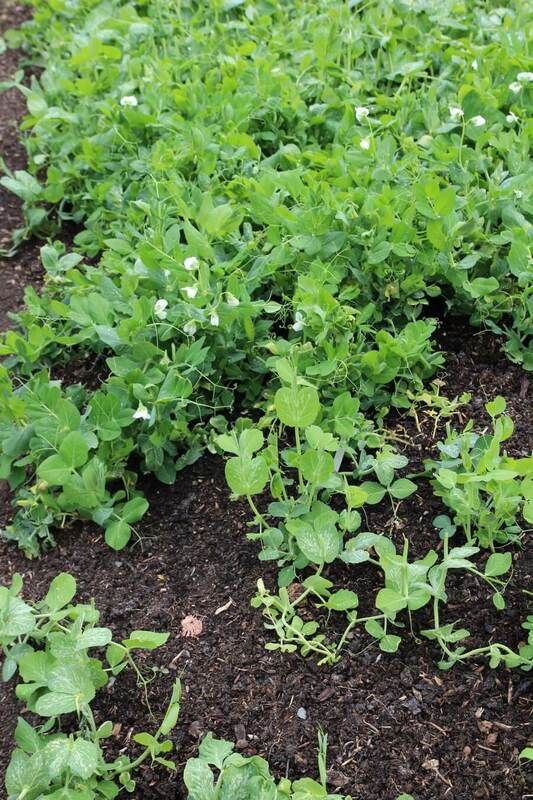 We have posted the first film of a “How to Grow” series of ten, and it covers pea shoots. 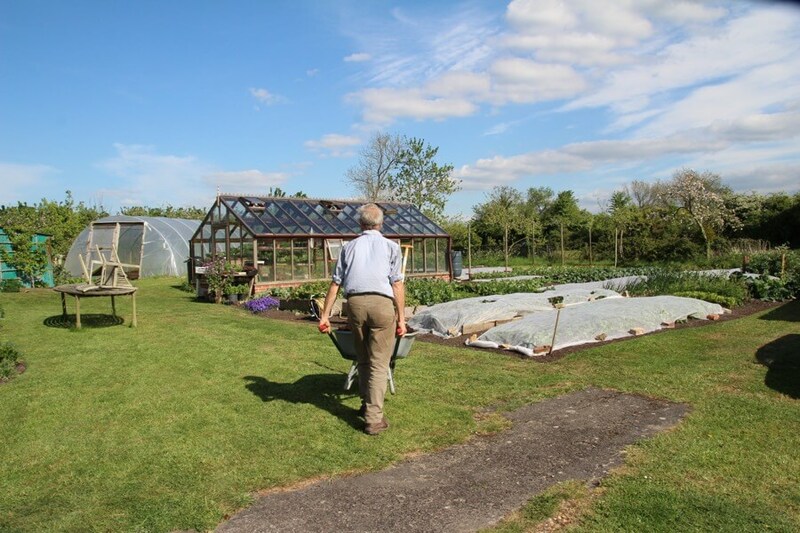 This is proving quite a project because Edward is filming me with the crops at all stages, from sowing to planting to protecting/weeding/supporting where needed, and finishing with methods of harvesting. Meanwhile on my channel the interest in Fourth Summer at Homeacres continues, it just passed 510,000 views for that one video. I have had some exciting trips. 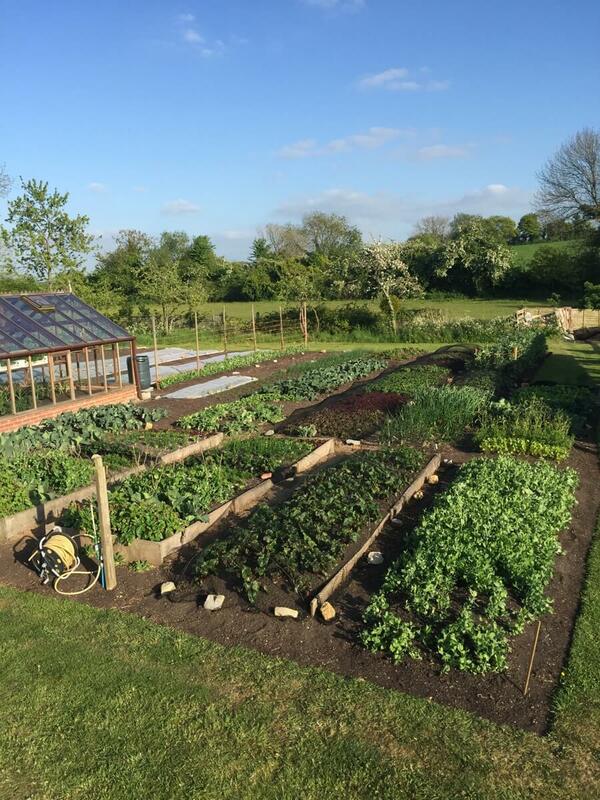 Giving a day course at Daylesford Organics in the Cotswolds allowed me and the participants to contrast intensive no dig with large scale, 20 acre veg growing using machinery, in the market garden run by Jez. He has a heavy soil (clay loam) which was in dry, hard lumps where it had been cultivated, and it had lost a lot of moisture too. 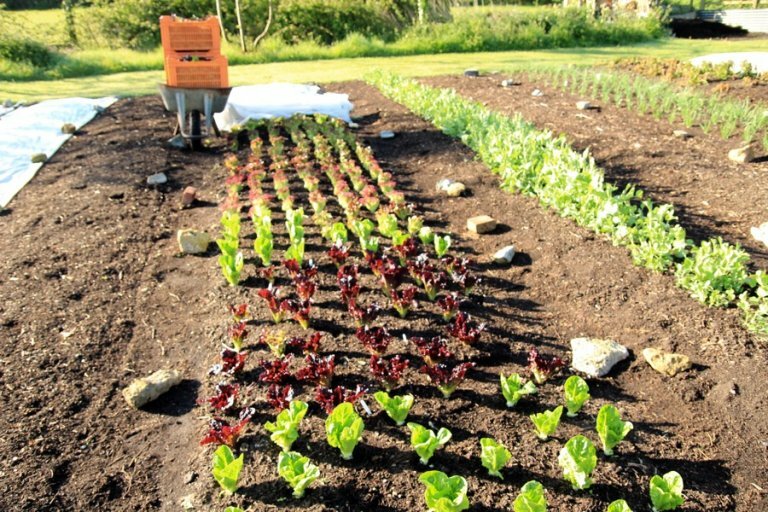 The challenge of moving to no dig on such a scale, which is possible, would require investment in compost and compost-making, and some scaling down of area to make more of the land at all times. 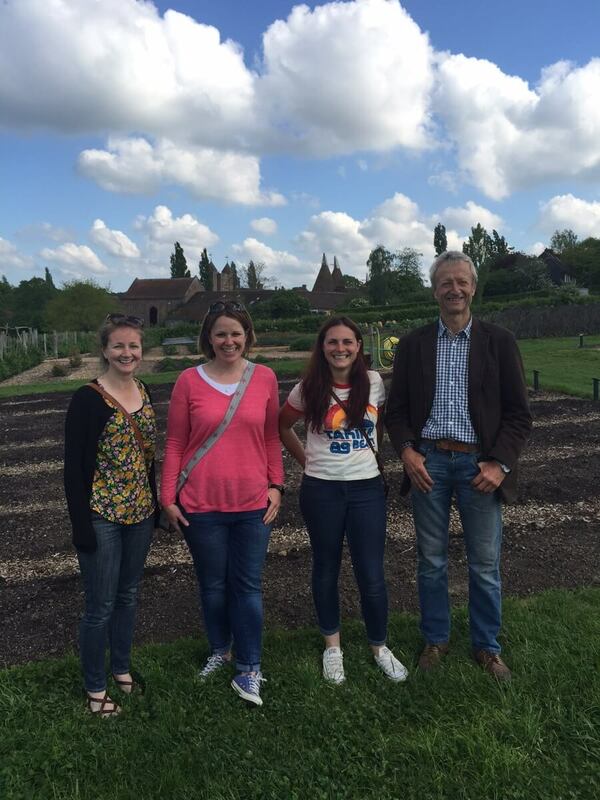 At Sissinghurst we saw a three quarter acre no dig garden, on yellow Kent clay. 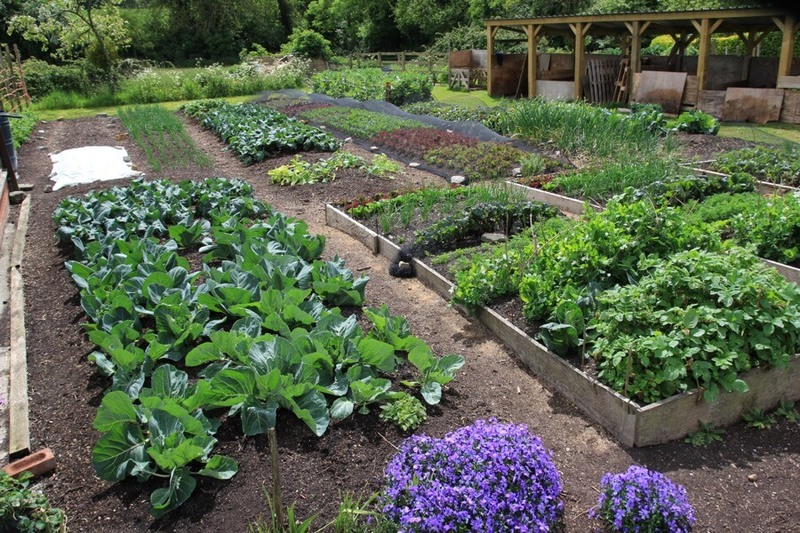 It produces five tonnes per annum of vegetables for the National Trust restaurant there. 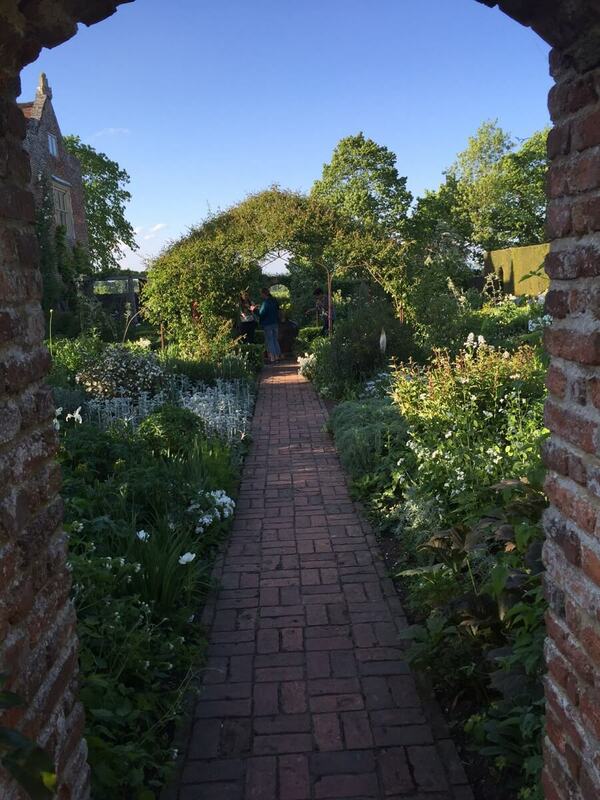 Helen Silver has got the garden running very smoothly, using one to two inches each year of green waste compost on the beds, and some small chips of green wood for the paths. 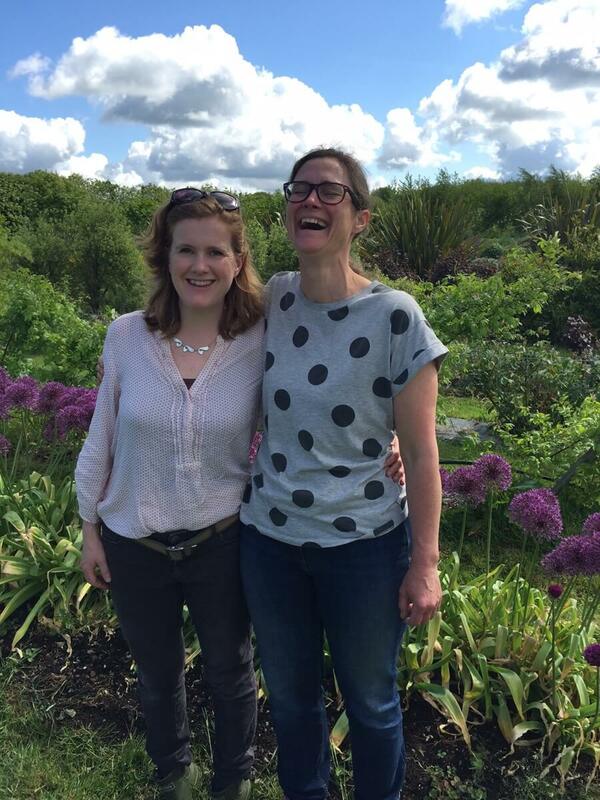 The next day I was speaking at Blooming Green’s no dig flower garden near Maidstone. Bec and Jen grow the flowers on beds mostly covered in mypex, with grass paths, and they have only three days a week to run the garden. Much time is saved by selling pick your own flowers. 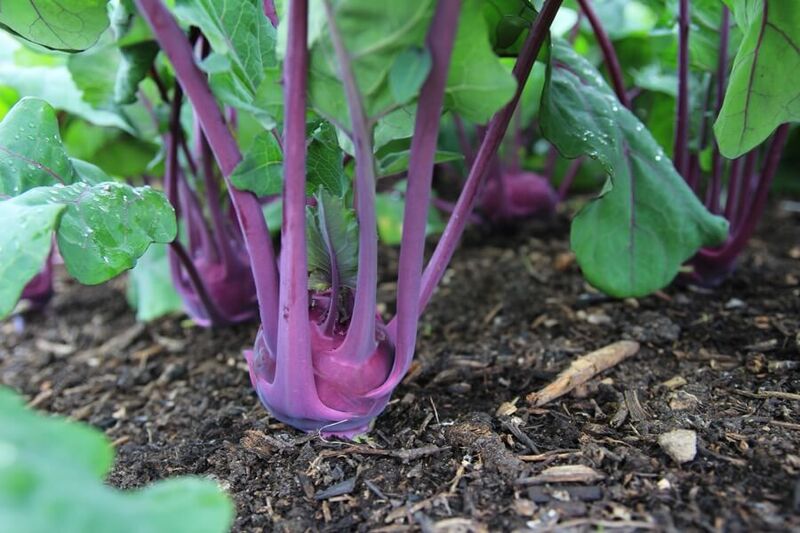 If you are using my method of compost mulches applied in the winter months, then hoed and raked lightly in early spring to kill the tiny weeds germinating, you should have few weeds to worry about now. 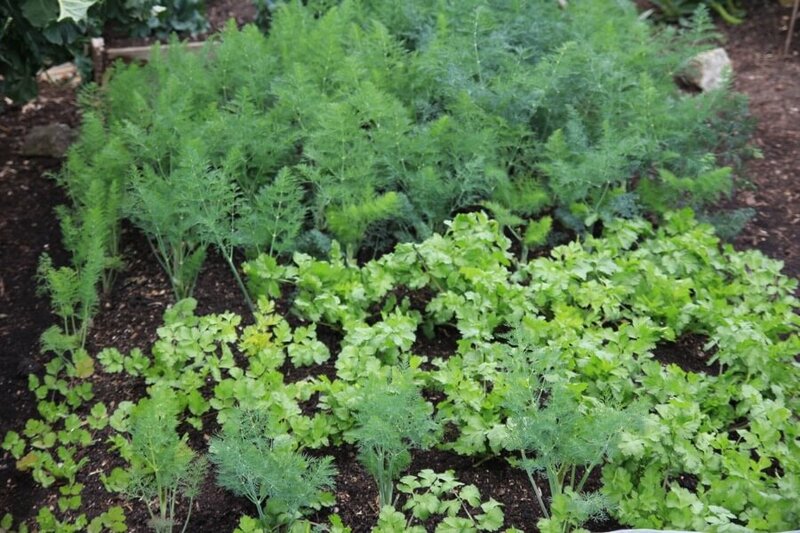 Simply pull any small weed seedlings you see, or hoe lightly (max. depth 1in/2cm) if you see many weed seedlings. For hoeing to work it needs to be a dry day. 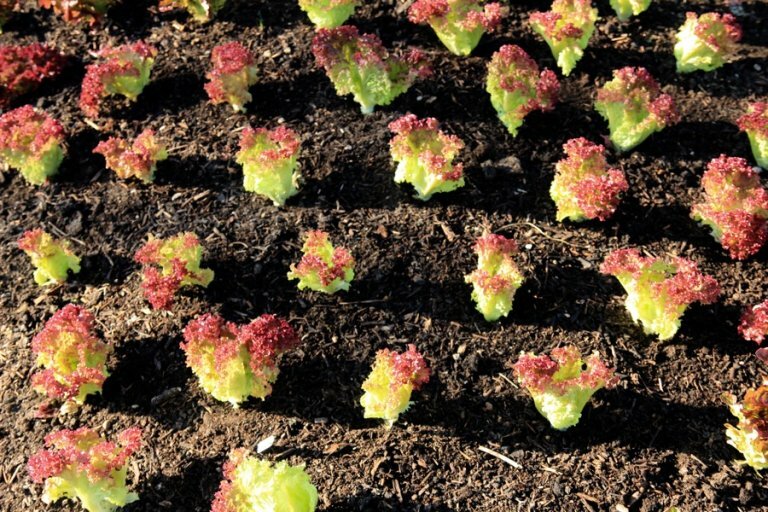 You can see how few weeds are in the beds below and it has not required much time or effort to keep them so clean, often we simply pull the few weeds while picking as in this example of harvesting lettuce. Should you still be clearing lots of perennial weeds, even starting from scratch, do check out these options for clearing. 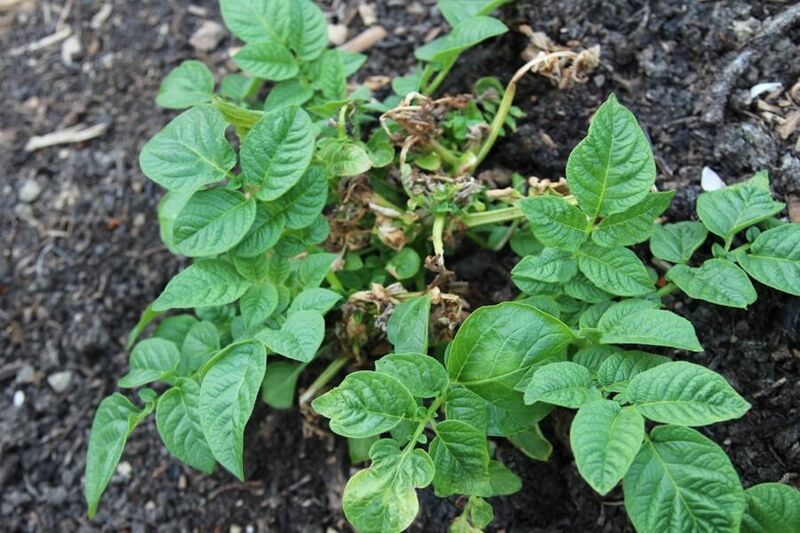 The frost damage to potato leaves is still visible, but plants are now growing strong new leaves. Aphids are building numbers, ahead of predators breeding and feeding, to equalise numbers. 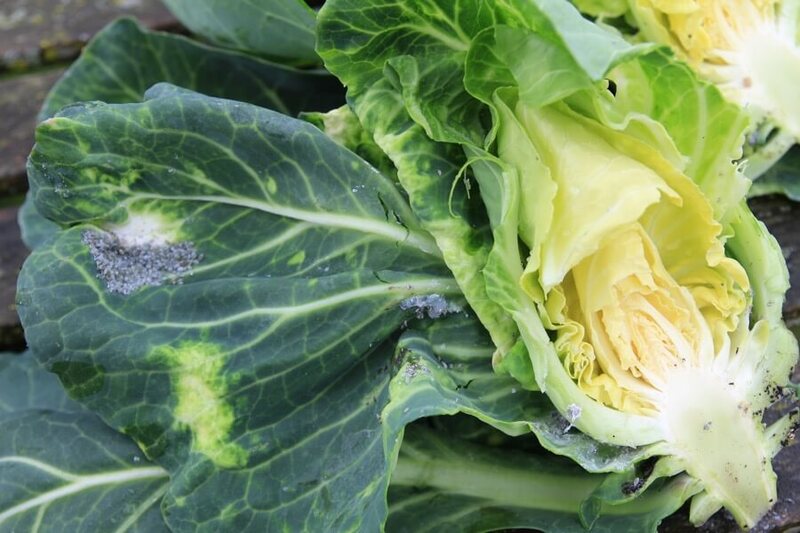 If you see clusters of grey aphids on brassicas, black ones on broad beans or white ones on tomatoes, best remedy is to squirt water so that some drop off, also to make sure the soil/compost is moist, as aphids like plants that are stressed by dry conditions. I hope your weather is going to plan, but often one is dealing with endless repetition of the same conditions. 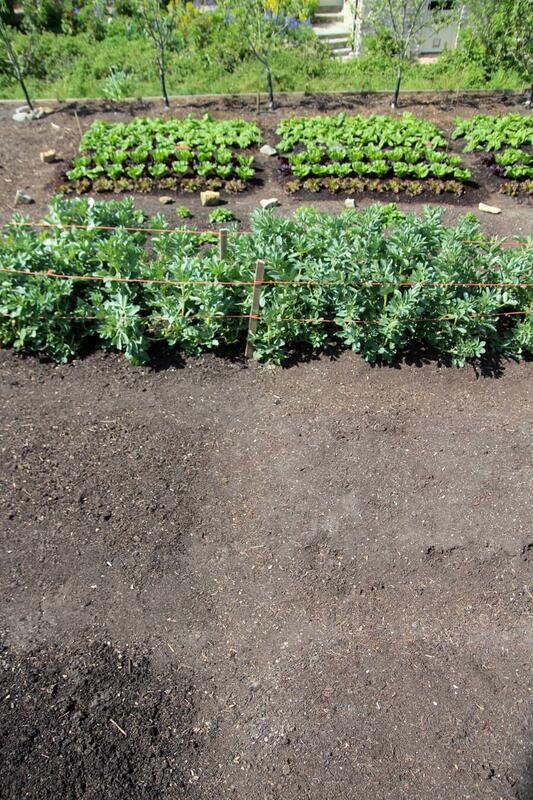 Here it was very dry until two days ago and I watered salads, spinach, pea shoots, radish, turnips and new plantings. Even after the rain (24mm/an inch) I am watering plants in. When watering plants in, direct the water onto their rootball only, not the whole bed. 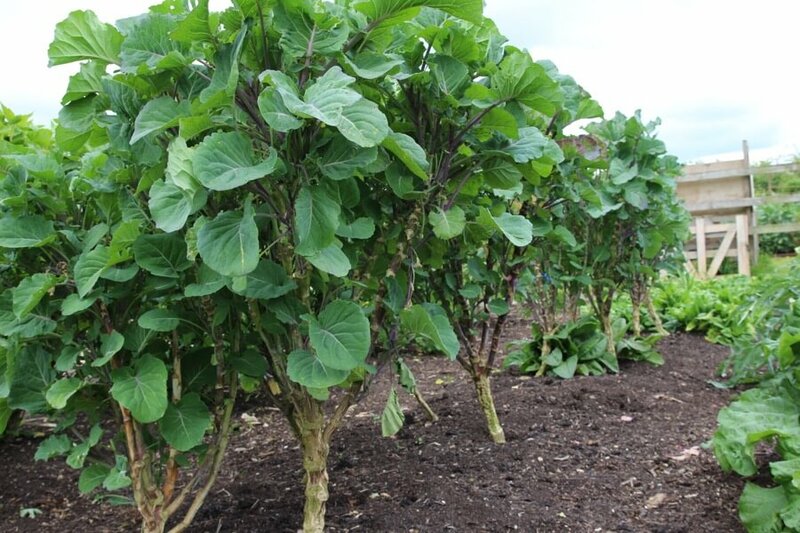 Repeat after two days if the weather stays dry, then leave them as long as possible, so that roots need to head downwards. Water again as harvests approach. Sometimes in extreme dryness and warmth, you need to give extra water. 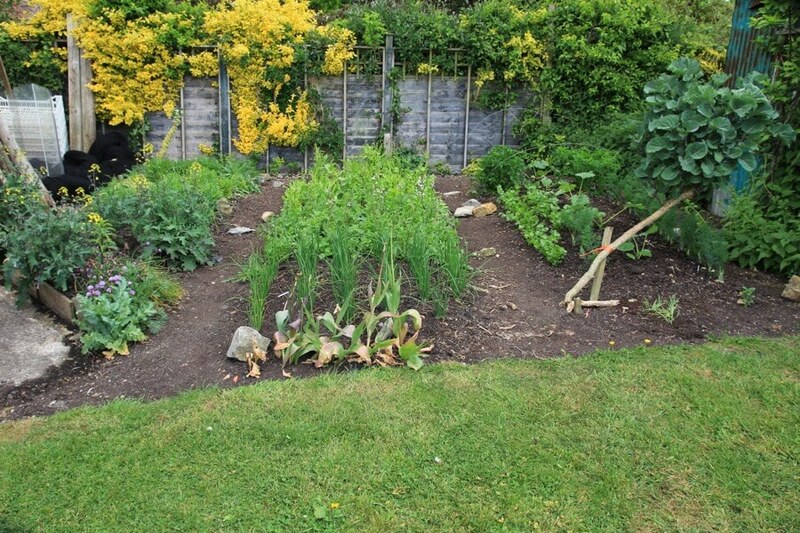 On 10th May I noticed the growing points of some foot-high peas (for pods) wilting in the afternoon sun, so we watered them, as well as beetroot, kohlrabi and spring onions that are close to harvest. Then on 14th May we caught a storm of 12mm/0.5in rain. Joy. 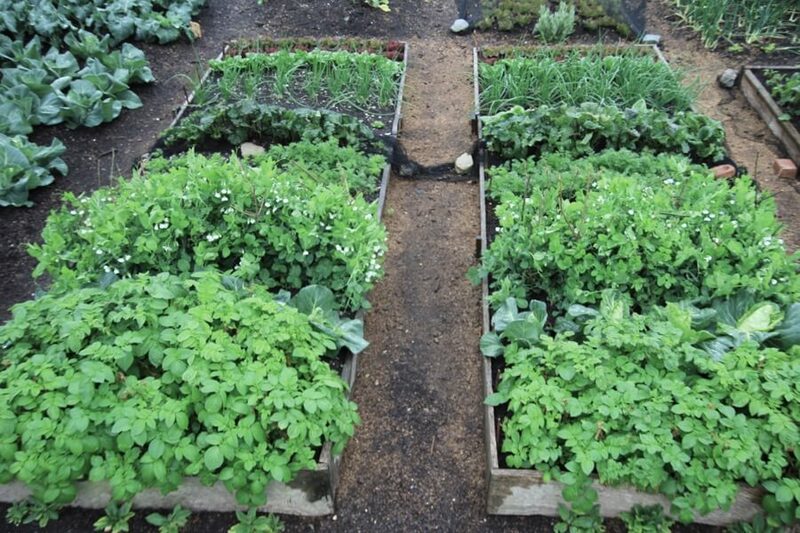 Hi Charles, nice update and the new video on pea shoots is the best yet; great pace, nice close ups and informative from sowing through to harvest and basic prep’.